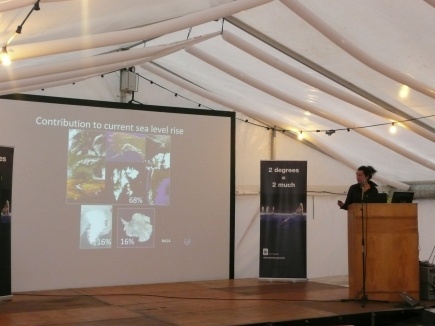 PhD-student Anne Chapuis presented her research on iceberg calving in the response of glaciers and ice sheets to climate change at a WWF event during the climate summit in Copenhagen. In this article she shares her thoughts from that day. When I heard that a few young scientists were invited to give a talk at the World Wildlife Fund (WWF) Arctic Tent in Copenhagen on Sunday December 6th, just one day before the opening of the climate negotiations at COP15, I jumped on the opportunity to be present. That is how I ended up presenting my PhD project and how it relates to the big questions of climate change last Sunday in front of people coming from all over the world. On my way to Copenhagen and before giving the talk, I had lots of questions in my head such as: Why was I doing that? What was my role in this big event? What can I do as a scientist but also as a human? Is there hope in the COP15 event? I am glad I am able to answer most of these questions today. COP15 appears to me, now even more than before my participation, like an essential and crucial event in history. My role was to present, as a young researcher, my PhD project and how it underlines the importance of studying and understanding how glaciers and ice sheets respond to climate change. The world’s top polar scientists were part of the program and I felt extremely privileged to be able to add my voice to theirs. This incredible experience taught me a lot as a scientist and as a citizen of planet earth and helped me understand the role of science in the climate change debate and what the general public expect from the scientists. First, as a scientist, I felt the duty to communicate what I know, what I have learnt in the most objective way, just looking for the truth. I understood that it is what people expect from the scientists. I also felt a need to make people trust the scientists. This is done by communicating a clear, understandable and objective message. I think one of the objectives of this climate summit is to build awareness in the public by giving them a clear picture of what is climate change so that they can decide for themselves and know how to act on an individual scale. Science really is at the base of climate change, and, if understood properly, our work can really make a difference in the choices policy-makers do. This implies an effort from both parties to communicate as clearly as possible to one another. This is not as easy task for scientists but, participating at this event was a good step forward to develop such skills. From a personal point of view it was a stunning experience to participate to such an event that was way beyond what I am use to. It was a big accomplishment in my career as a young scientist to add a stone to the huge edifice of climate change research. The feeling of being active and useful was highly satisfying because I felt I was doing the right thing. Meeting all those people from all over the world showing interest, enthusiasm and who were ready to act to try to limit the impact of climate change made me feel that there is definitely hope in COP15 and the future. The main message I will remember from those two days in Copenhagen is that we do not only have to hope for politicians to take a responsible and engaged decision at the end of the climate summit, but we, as individual, can and must act in order to reduce our impact on the planet. Peter Wadhams, Head of the Polar Ocean Physics Group at the University of Cambridge in the UK, presented the status of arctic sea ice and how it is decaying much faster than predicted by the models. Emily Frazer, from the University of Reading in the UK, presented her Master project on snow cover, underlying all the uncertainties still related to modeling. Jim Overland, division leader of the Coastal and Arctic Research at NOAA (National Oceanic and Atmospheric Administration) in the US, showed how changes in the Arctic were faster than expected and why the changes in temperature that we observed now are different from the ones that have happened in the past, in the way they are not part of natural variability but driven by humans. Anne Chapuis, PhD-student from the Norwegian university of Life Sciences, presented the importance of iceberg calving in the response of glaciers and ice sheets to climate change. Dorthe Dahl-Jensen, professor at the Niels Bor Institude in Copenhagen and head for the Center for Ice and Climate, talked of changes of the Greenland Ice Sheet. Lars-Otto Reiersen, executive secretary of the Arctic Monitoring and Assessment Programme (AMAP) from Norway, introduced a movie showing changes in the Arctic. Martin Sommerkorn, from WWF, presented work on how carbon stored in the Arctic will be released in the future as a consequence of climate change and how this release will enhance climate change as a very powerful positive feedback. Bob Corell, director of the US global change Program at the H. John Heinz III Center for Science, Economics and the Environment and Chair of the Arctic Climate Impact Assessment (ACIA), presented work on Arctic climate change and greenhouse gas mitigation policies, highlighting the huge effort that is needed in order to limit the effect of climate change. Walled Abdalati, head of the Cryospheric Sciences Branch at NASA’s Goddard Space Fligth Center, drew a nice synthesis of arctic climate change viewed from space. The future response of glaciers and ice sheets to climate change is poorly understood. However, their contribution to sea level rise is very important. The goal of my research project is to better understand the role of ice dynamics in the response of glaciers and ice sheets to climate change. Ice dynamics are currently poorly understood and implemented in numerical models, which is one of the main limitations to predict the future of glaciers and ice sheets changes. My project focusses on iceberg calving, which had a large role in the desintegration of the past ice sheets and triggers current retreat and acceleration of tidewaters and outlet glaciers. In order to improve quantitative measurements and predictions of iceberg calving activity I first collected calving event data at Kronebreen, Svalbard, and then tested the influence that different possible controls such as the local environment parameters have on the calving activity. 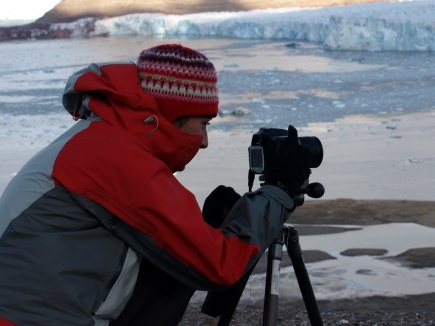 This project is very relevant in the effort made to improve the understanding of the future behaviour of glaciers and ice sheets and thus the future increase of sea level rise. We started the first period of contimuous observations of calving events during one week in August 2008 and continued with two weeks in August 2009. We collected the timing, size, style and location of more than 6000 calving events. My first results suggest that calving glaciers are very sensitive to changes in their close environment such as air temperature and sun radiation and that their response to external pertubations is complex, unpredictable and non linear.